What is a Form Fill and Seal Machine? A "Form Fill and Seal Machine" is a machine being used to fold and seal a bag, then fill and seal the bag. It is a systematic and advanced bagging machinery that is used in high volume packaging in a wide range of bag sizes up to 20kg in capacity. Commonly utilised for food and other products packaging and can be made to be used for horticultural products such as soil media. What are the uses of Form Fill and Seal Machine? With the Form Fill and Seal Machine, it is faster and easier to bag product using a single machine without any operator. Instead of manually holding and filling bags then sealing the bag, operators can use the form fill and seal machine to speed up the process and have consistent bagging rates. It saves labour cost, reduces the risk of injury for workers and increases production rates. These machines are generally only one machine of many in the production line. Partners with filling hoppers, weighers, take off conveyors, bag flattening, robot packing, palletising and shrink wrapping equipment. Why choose C-Mac’s Form Fill and Seal Machine? C-Mac partners with a local manufacturer in providing this piece of Australian made equipment to high standard. We aim to give you effective solutions to your bagging problems. C-Mac is providing a customisable "Form Fill and Seal Machine" for your packaging. It is a heavy-duty machine for long term usage. 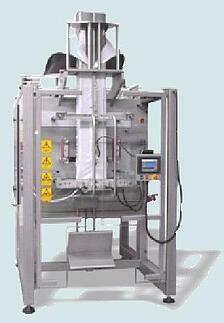 The machinery can pack up to 50 bags a minute so you can ensure a big increase on your production rate. Suitable for: various sands, barks, potting mixes, manures, pebbles etc. To produce all bag styles including Reclosable Zipper. Stainless steel construction as standard. Colour Touch screen with context sensitive help screens. Highly flexible with double length film draw function as standard. All optional accessories available in this series. Can handle stones up to 80mm in diameter. Locally available and internationally recognised components used e.g. Festo, SMC, Baldor, Omron, etc. If you are interested, you can call C-Mac today. You can also click the button below to see its prices or ask for a free quote now.